Well, it's time to call a halt to the live text commentary. Congratulations to Martin Canning and his Hamilton players. They can look forward to top-flight football next season. For the Steelmen, there will be a few nervy moments in this season yet. Thanks for joining me this evening. All the best. "I think I'll wear my suit and sit in the stand every week! The last few weeks the performances have been good but tonight we got the result we deserved. From a personal point of view I haven't been too concerned (at the run of 13 games without a win prior to this evening). The club have been brilliant. The boys are capable of winning games in the Premier League. In everything I do I want to win. I wanted that win as soon as I could get it but tonight was about the players getting the win that they deserved." Back to the snooker for a second and "over the moon" and "ecstatic" are the words used by Anthony McGill in his post-match interview after defeating the reigning world champion Mark Selby. Hamilton fans and masochistic Well supporters will be keen to know that we will be publishing highlights of the match on the website at midnight. "There may come a time when Motherwell have to accept that they are in the playoffs and then focus on winning those games. I don't see them winning their last four games and digging themselves out of this." Anonymous: "If the Buddies win tomorrow then beat 'well, its back to 4 points. I hear a tune..."
How must Hamilton player-manager Martin Canning be feeling? He'll be delighted, of course, that his team have ended their 13-game winless run, especially in a derby match, but he'll be hurting that he was not able to be in the dugout or the changing room as he served a touchline ban. Credit to Lee Erwin whose appetite for the match has not dimmed despite the score. He is shoulder-charged off the ball in the Accies box but, refreshingly, makes no attempt to claim a spot-kick. Accies break and Ali Crawford pings a delicious ball out to the right wing that wins his team a throw-in and kills a few seconds. That would be called a "touch finder" in rugby. Lee Erwin shows three Accies players a clean pair of heels and races in on Accies goalie Michael McGovern, who makes an excellent save from his low shot. If Motherwell lose this one and Ross County win at home on Saturday against Partick Thistle, the Staggies would be nine points clear of Well with four games to go. The Motherwell fans begin to stream out of New Douglas Park as John Sutton's flicked header from the free-kick from out on the left goes just wide of the far post. Ali Crawford waves to the fans after scoring Accies' second goal against the Steelmen. Scott McDonald has been taken off in favour of big John Sutton, causing BBC Scotland football pundit Derek Ferguson a great deal of consternation, puzzled as to why Ian Baraclough wouldn't wish to pair those two to try to get something out of the game. Away from the football for a moment and huge congratulations to Clydebank's Anthony McGill who has knocked the world champion Mark Selby out of the World Championship at the Crucible. 13-9 the final score. Wow. Allan Steele on Facebook with a gloomy prediction for Well fans: "Game over dont fancy any of the three in the play offs." A few chances there as Motherwell sub Dom Thomas clips the Accies post with a left-foot shot and Nigel Hasselbaink has a shot saved by Motherwell keeper George Long followed by a header over the bar by Michael Devlin. Scorer Jason Scotland comes off for the Accies to be replaced by Nigel Hasselbaink, following an earlier substitution of injured Jesus Garcia Tena for Lucas Tagliapietra. Hibs manager Alan Stubbs takes in the match at Hamilton, presumably keeping an eye on Motherwell, just in case his team and the Steelmen meet in the Premiership play-off final. And if Motherwell lose tonight they will have failed to win at New Douglas Park in their last six visits. My colleague John Barnes informs me that Ali Crawford has now scored four goals in four appearances against Motherwell this season. "Lumping the ball forward just doesn't suit Motherwell at all. It's just giving Hamilton the ball back." I'm fretting over that as-it-stands Premiership table on our web page showing Accies are now in the top six. I'm expecting a call from Dundee manager Paul Hartley any minute, now that his team have been demoted by the Beeb! Dougie Imrie sweeps in from the right touchline and picks out Ali Crawford with a nicely weighted pass and his whippet-like team-mate fizzes a low shot from 18 yards past the helpless George Long for his 10th goal of the season. Ali Crawford curls a powerful shot at the Motherwell goal from 22 yards but George Long has time to shuffle across his line and take the sting out of it with a few dabs from his gloves. Hamilton are showing flashes of their early season form - crisp passes, movement, keen runners. Jason Scotland gallops into the Motherwell box creating mayhem and the ball falls from a height for midfielder Darian MacKinnon...whose volley from 18 yards threatens satellite dishes on houses three streets away. Dearie me. Hamilton kick off the second half, a trio of their players full of smiles in the centre circle. Simon Boendermaker: "I wonder if Baraclough already has one eye on potential matches against Rangers or Hibs #bbcscotfootball"
Sharp-eyed viewers will have noticed that there is a problem with our "as it stands" Premiership table. Hamilton are showing as being in sixth place, clearly not possible for a bottom-six fixture. The top-six split is clearly too much for our system. Please bear with us while our technical colleagues try to fix it. Thanks. Jason Scotland places a firm shot past George Long in the Motherwell net for the only goal of the game so far. So, that was a half that took a wee while to get going but then provided plenty of excitement with Jason Scotland's fine strike for the Accies goal, Michael Devlin's header hitting the bar and Motherwell twice hitting the woodwork through Lee Erwin and Marvin Johnson. Lee Erwin takes a lovely reverse pass from Scott McDonald inside the box and looks well positioned to score, but Michael McGovern races from his line and saves the shot with his legs. Seconds later Lionel Ainsworth pulls his right-foot shot wide from the edge of the box. Motherwell are ending the half on the attack. Just a few minutes to go until half-time. Motherwell have gone close through Lee Erwin and Marvin Johnson but they will need to be more accurate in front of goal if they are to avoid a painful defeat at their rivals' ground. Darian MacKinnon congratulates Hamilton's first-half scorer Jason Scotland. Commentator Rob Maclean informs listeners that Hamilton last won on 4 January, away to St Johnstone. Since then it has been four draws and nine defeats for Martin Canning's team. Motherwell's Marvin Johnson cuts in-field to place the ball on to his right foot and hits a shot off the Hamilton bar. In a blur, Darian MacKinnon has a chance for Accies but his powerful right-foot shot from inside the box is saved. This is better stuff from both teams now. Ali Crawford has a shot at goal blocked and as Accies keep up the pressure Michael Devlin sends a looping header off the crossbar. At the other end, young sub Fraser Kerr heads high over the bar when unmarked at a corner. Motherwell's Ian Baraclough is forced into a change as Fraser Kerr replaces Louis Laing because of an injury. 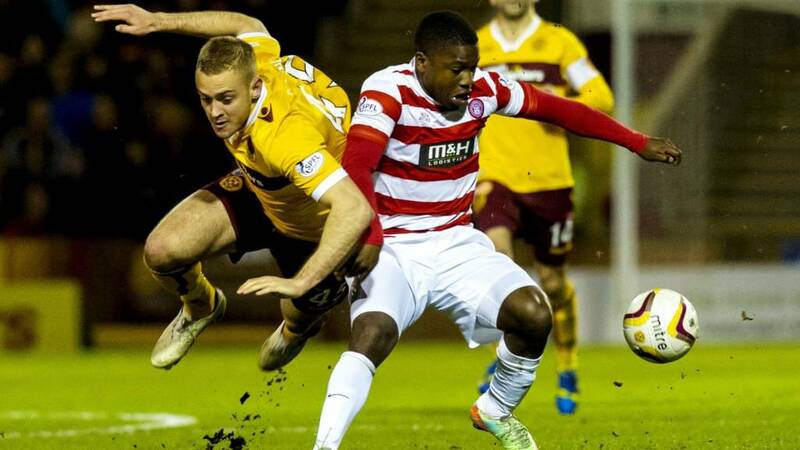 Motherwell's Lee Erwin holds off Accies defender Jesus Garcia Tena at New Douglas Park. Pesky striker Scott McDonald gives strapping defender Michael Devlin no time to head the bouncing ball clear just outside the Hamilton box and manages to out-muscle his opponent and poke the ball to Lee Erwin who cracks a shot that is a whisker off target. Jason Scotland is the beneficiary of a lovely pass from the ever alert Ali Crawford and he breezes through the Motherwell defence and lashes a shot into the net to open the scoring. A quick update on snooker's World Championship - young Clydebank player Anthony McGill is one frame away from beating the reigning champ Mark Selby. He leads 12-7! Neither team has been able to show any sustained composure, with passing going astray every 15 seconds or so. It's a nervy time of year in football. Anthony Straker shows a cool head as he weaves his way past a few red-and-white-hooped jerseys at his left-back position - then over-hits his pass in-field and Ali Crawford is the grateful recipient as he tries to build an attack for the home side. Lionel Ainsworth's powerful shot from the right-hand side of the box takes a deflection on its way towards the Hamilton goal where Michael McGovern has to be on his toes to palm the ball to safety. Accies' busy striker Dougie Imrie is still clutching his arm after appearing to bash it off the barrier around the pitch. Accies striker Dougie Imrie falls in the box and the home fans make half-hearted claims for a penalty. The ball bobbles out to Grant Gillespie on the edge of the box but the versatile Accies man is off balance and slices the ball over George Long's Motherwell crossbar. The game has yet to settle down, but there's a good atmosphere in the compact ground. Well manager Ian Baraclough looks to have an Alex Ferguson-style quantity of chewing gum in his mouth - he's chewing away nervously in the dugout. Winger Marvin Johnson returns from injury for Motherwell, allowing Lee Erwin to move back up front with John Sutton dropping to the bench. Accies right-back Ziggy Gordon drops out through injury with Jesus Garcia Tena taking his place. Jason Scotland comes in for Nigel Hasselbaink up front. The teams are out on the artificial surface. We're just about ready for kick-off! Les Gray took on the pre-match interview duties there because Martin Canning is serving a touchline ban. "The team is going through a rocky spell just now. 'Can't buy a win' would be the phrase. We haven't won a game in 14. It's really frustrating but we have to start tonight. Alex Neil is the highest quality player we've lost, plus Tony Andreu, our top scorer. We just want to win tonight and finish in seventh spot. Martin Canning is here to develop our young players. Martin will be the manager next season and beyond." Hamilton: McGovern, Lyon, Devlin, Garcia Tena, Hendrie, Longridge, MacKinnon, Gillespie, Crawford, Imrie, Scotland. Subs: Hasselbaink, MacDonald, Watson, Brophy, Docherty, Hill, Tagliapietra. Motherwell: George Long, Law, Laing, McManus, Straker, Ainsworth, Lasley, Pearson, Johnson, Erwin, McDonald. Subs: Ramsden, Sutton, Twardzik, Kerr, Moore, Dominic Thomas, Grant. "There's a lot of good stuff going on at this football club and we want to keep that going." "For us it's about getting points on the board early in these last five games. We have to make sure we're a Premiership side next season. We need to get close to those teams above us." Hamilton will be looking to put one over on the Steelmen, which would go some way to easing the disappointment of missing out on a top-six Premiership finish. For Well, their need for three points is pressing. They are desperate to move clear of the play-off zone but they are six points adrift of 10th-placed Ross County. Good evening to our coverage of the Scottish Premiership match between Hamilton Accies and Lanarkshire rivals Motherwell at New Douglas Park.